Ok, so I’m not sure if other countries have Black Friday Sales, but in America people go nuts. Why? 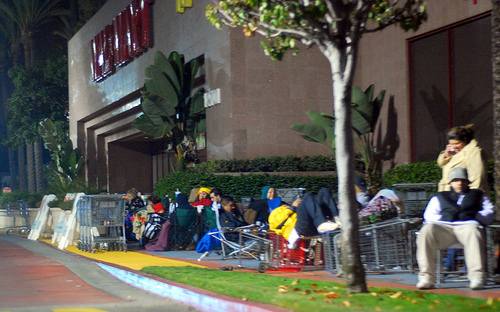 I don’t like to shop on a regular day, I’m sure not going to go on the day 95% of America is too… People camp out at stores waiting for them to open the doors at or before daylight on Black Friday. That’s if they didn’t go right after filling up with turkey and dressing to the stores that opened on Thanksgiving night. How on earth can you get your mind wrapped around Christmas shopping when you are miserable from eating so much? It amazes me how many people live for Black Friday. I guess I’m just weird, but I don’t like shopping and especially standing in line. As for me, I shop online. Cyber Monday I will sitting at my laptop clicking away. All I have to do is find what I want and then click checkout. No lines, no angry people snatching items out of your hands, and no driving anywhere. I can shop in the comfort of my own home, sitting with a cup of coffee, just enjoying the Christmas season. Categories: America, Black Friday, Christmas, Coffee, Experiences, Fun, Inspiration, Internet, Journey, Life, Meltdown, Sale, Scary, Shopping, Thanksgiving, True Story, Uncategorized, Writing | Tags: america, Black Friday, checkout, Christmas shopping, coffee, driving, lines, shop, shopping, Stephanie Hurt, Stephanie Payne Hurt | Permalink.